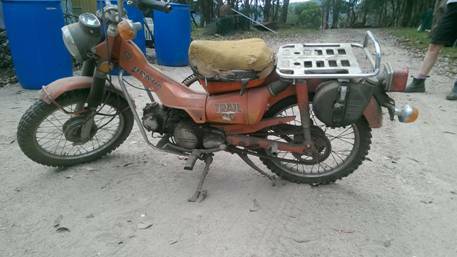 In Australia this motorcycle is best known colloquially as the ‘Postie Bike’ (for obvious reasons). It is the most common motorcycle in Australia. Elsewhere known as the ‘Cub’ it is the most produced vehicle in history with over 60 MILLION having been made by 2008. A brief history here: https://en.wikipedia.org/wiki/Honda_Super_Cub I picked up my ‘latest’ one this afternoon (Thanks eBay) for $450. It is a 1981 CT90 in dual range format. It had been ‘buried’ in a shed for over twenty years, and is in almost ‘mint’ condition (with only 5K on the ‘clock’). Just poured some fresh petrol in the tank and it started first kick and ran like a watch! It will take me many tens of thousands of kilometres yet. It needs only a new seat cover, battery & mirrors to make it registerable. ‘Club’ registration is available for such older vehicles (in this case for about $70 per year). In low range it will creep up the steepest hill (and go many places a 4WD will not). Indeed if you own one of these (known in Australia as the CT110 AG – for ‘Agricultural’) you won’t need a 4WD. I believe it was originally released (in Japan) as the Honda Hunter Cub, an appropriate name! The ‘Australia Post’ models are only single range. If you want a dual range, you have to look out for the oval transfer case on the left hand side of the transmission just aft of the footpeg. The front rack is also usually a good indication, though this one doesn’t have one (it will soon!) Nice big rack on the back to carry your pack, gun or whatever; another smaller one on the front. This one has a spare petrol tank underneath the rear rack which together with the main tank should give me a range of 300 kms or more. It has pillion footpegs too (though one’s passenger might want a cushion). These ones are home made: I will replace them with the OEM ones which flip up. It will take me into the Wonnangatta after the gates are locked (Queens B’Day) and the river is uncrossable by a 4WD (there is a pedestrian ‘swing’ bridge). I have a ‘bike tow’ gadget that slips into the Hayman Reece coupling. The front wheel of the bike sits up on it and the bike just tags along. It will also mean we can undertake many canoeing expeditions taking only one car – the bike will get me back to the car. The same applies to long walks. Many adventures await us and my ‘new’ bike!